Stock photo of a beach scene at Arch Point, Abel Tasman National Park, Tasman District, South Island, New Zealand. Arch Point in Abel Tasman National Park, Tasman District, South Island, New Zealand. This stock photo shows the Arch Point framing the wonderful beach scene at Abel Tasman National Park, Tasman District, South Island, New Zealand. 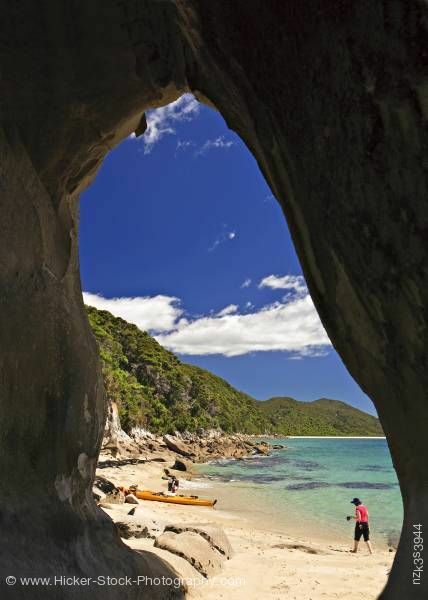 A view through the Arch Point of Abel Tasman National Park shows the clear waters and sandy beach where a yellow canoe sits waiting on the shore. A woman walks along the sandy shore towards the yellow canoe. The rocky outline of the arch frames the beautiful beach scene. The clear turquoise waters reveal rocks scattered on the sandy bottom. Lush green foliage grows on the rocky hillside which runs along the shores of South Island. Layers of rock line the shores just below the leafy hillside. A bright blue sky and white soft clouds add to the beauty of this restful tropical scene. Arch Point, Abel Tasman National Park, Tasman District, South Island, New Zealand.